Circle J Heating and Air Conditioning delivers a full range of services to our customers with an unsurpassed attention to detail. 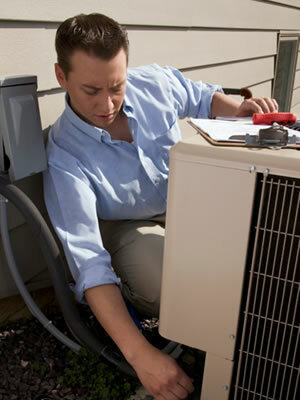 When you need service or repair on your home or business air conditioning system, Circle J Heating and Air’s skilled technicians have a talent for cutting to the chase and quickly returning things to normal. Need a new system? Our dedicated comfort consultants will personally assess your home or business FREE and design a system that fits your situation and budget. We also provide indoor air quality products and dehumidifying to ensure your comfort on the hottest days. From electric, gas, and oil furnaces to heat pumps, boilers and hot water heaters, we repair and replace all heating systems. We can make recommendations on the best choice for your home or business environment and we offer FREE consultations. We also offer Energy Star rated heating systems, so you can save up to 30% on heating costs during the winter while staying warm. Small problems can become bigger problems if you let things go. Before the cooling or heating seasons, it is a good idea to have your system checked out by one of our maintenance experts. The Circle J Heating and Air team will conduct a thorough inspection and cleaning of your air conditioning and heating system to improve performance and avoid costly breakdowns. For even more peace of mind, we offer annual preventative maintenance plans that keep your equipment operating at peak efficiency and cost savings year round. Circle J Heating and Air offers complete residential and commercial air duct cleaning services to help improve air quality and remove dust, pollen, mold spores and more. We can even test your indoor air quality while we are doing your maintenance and cleaning. Our technicians have been trained to take surface mold samples to ensure that your home or building has the cleanest air possible. And if you need duct work design assistance, we can create the ideal configuration for your specific comfort system. Have a question or need service? We’re always available to jump in with an answer or some hands-on help. Call us at (817) 249-6898.